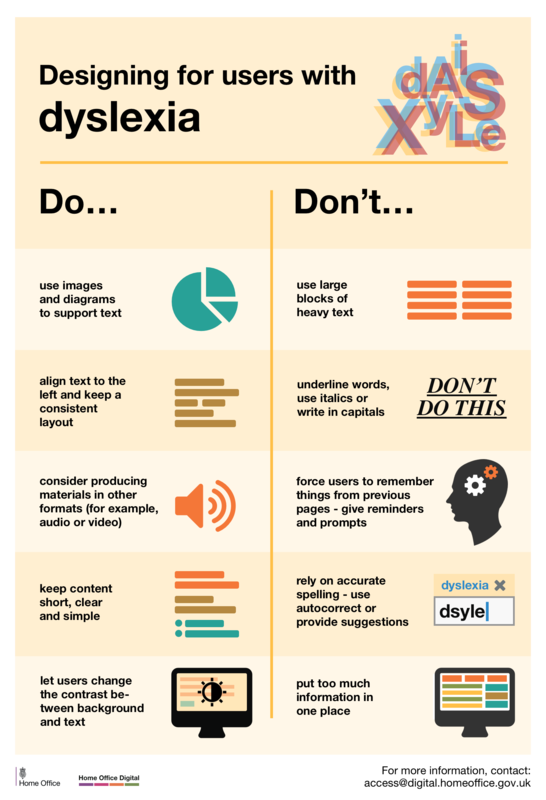 Posters showing the dos and don'ts of designing for users with accessibility needs including autism, blindness, low vision, D/deaf or hard of hearing, mobility and dyslexia. 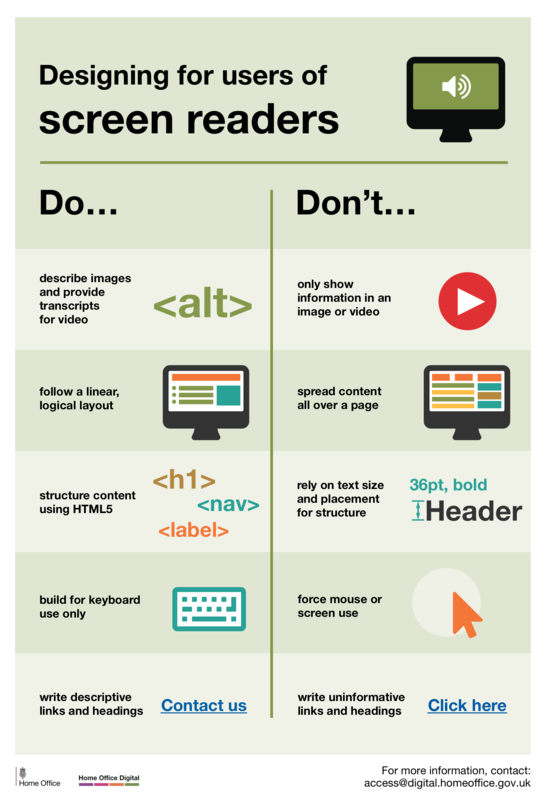 The dos, that run across various posters, include using things like good colour contrasts, legible font sizes and linear layouts. So, aren’t good design principles applicable to everyone and not just those with access needs? While this is true, the aim of the posters is to raise awareness of various conditions through good design practice. We need to be mindful of not just designing or building for our own immediate needs. For example, consider designing for keyboard use only. 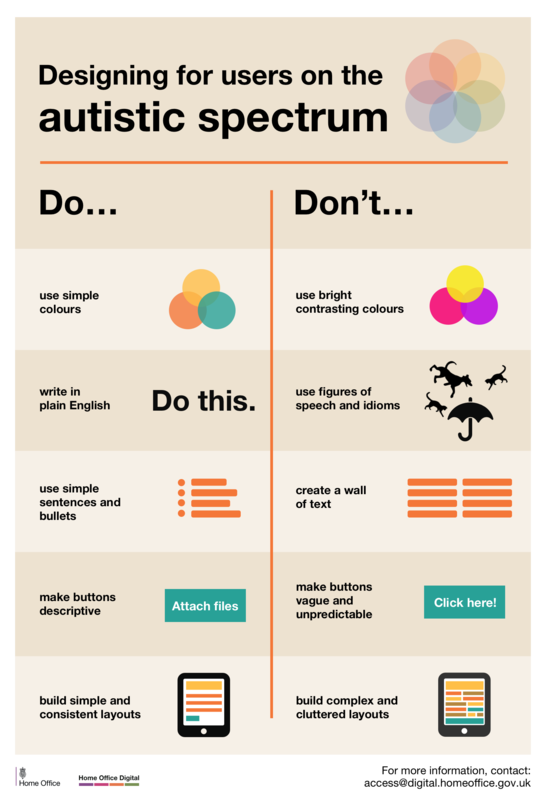 This is particularly helpful for users with motor disabilities where using the mouse can be quite difficult, especially with precise movements, whereas keyboard use is much easier. 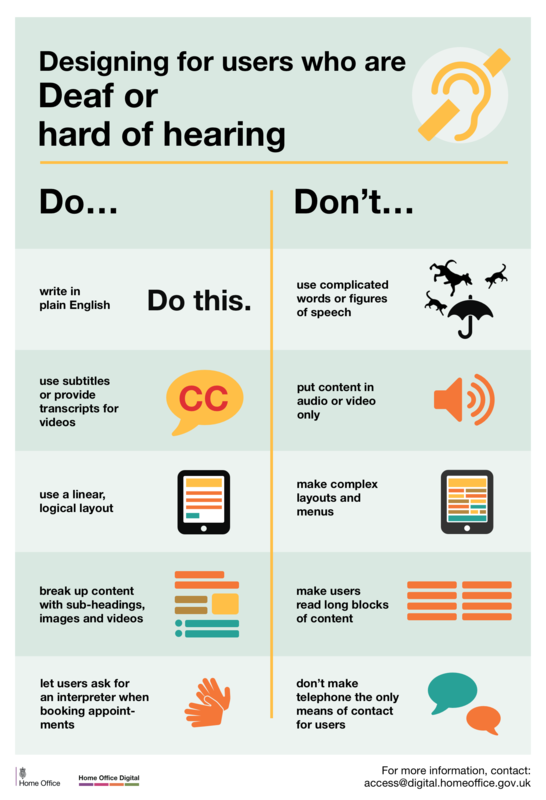 The content for the posters came from our accessibility team in Home Office Digital. Led by accessibility leads Emily Ball and James Buller, we are a group of twelve, each specialising on these conditions: blind and visual impairment, dyslexia, autism and ADHD, D/deaf and hard of hearing, mental health and motor disabilities. Collectively, we learn as much of the conditions as we can to better increase our knowledge so they can be shared within and outside the team. One of the challenges we faced with the posters was gathering information from our different specialisms and reducing the vast amount of knowledge to ten principal dos and dont’s. There's also challenges surrounding content and graphics. 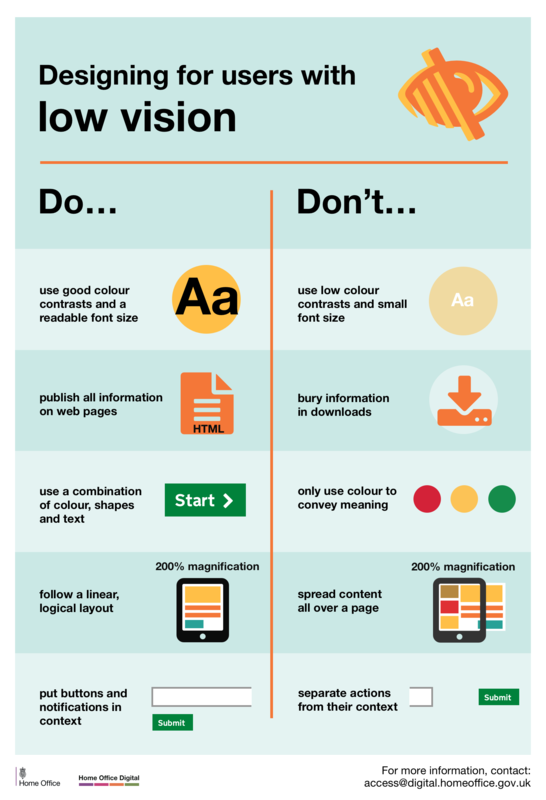 I worked with Nick Cowan, a content designer, who is leading on motor disabilities, to keep the content concise and ensure the graphics visibly represented the advice accurately. We’ve shared these posters across government for feedback and they can be found on GitHub. We are constantly improving and adding to them so please let us know what you think. 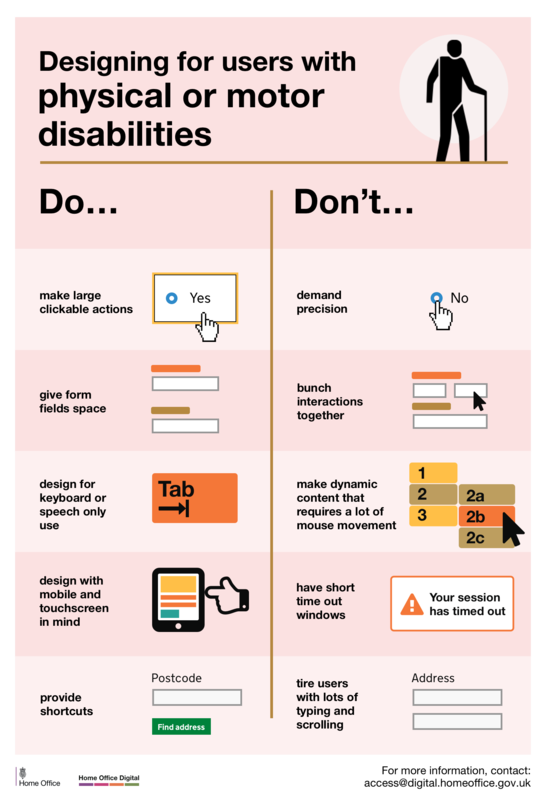 Understanding accessibility through design means we can build better services for everyone, whatever their access need. Follow Karwai on Twitter and don't forget to sign up to email alerts.